Both the RAMCHECK LX DDR4 (p/n INN-8686-DDR4) and DDR4 Pro tester (p/n INN-8686-DDR4-PRO) test and identify JEDEC-compliant registered and unbuffered DDR4 DIMMs. No special setup is required. 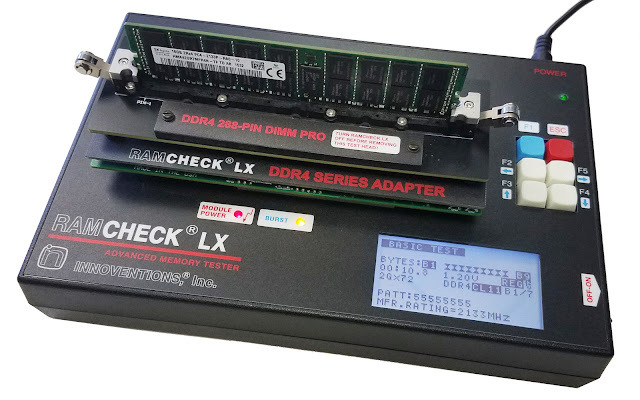 The RAMCHECK LX DDR4 includes a complimentary 288-pin test head featuring a high-quality production socket, while the RAMCHECK LX DDR4 Pro includes a rugged 288-pin Low Insertion Force (LIF) socket for high-volume testing. Test heads for SO-DIMM are under development and will be available soon. During each test, the memory module's size, structure, and type are automatically detected. RAMCHECK LX quickly spots bad memory chips and alerts the user with a warning tone and visual signal. The Basic Test for a 32GB DIMM is less than 3 minutes while the test for 8GB DIMM is about 40 seconds. 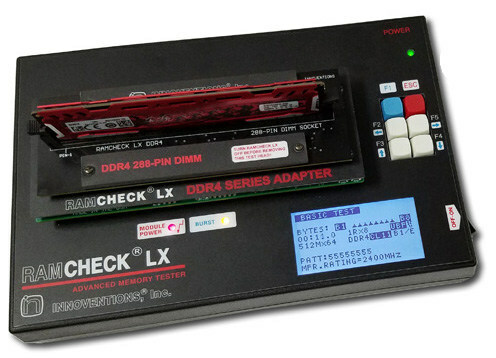 The RAMCHECK LX DDR4 tester is available for $2495.00. The DDR4 Pro tester is $3850.00. For more information, call INNOVENTIONS at 1-281-879-6226, email sales@innoventions.com, or visit http://www.memorytesters.com .